New waves of violence in South Sudan have worried governments around the world, and Beijing is no exception. Clashes between rebel forces and the South Sudanese government jeopardize the lives of Chinese citizens in the country, as well as throwing into question the future of South Sudan’s vast oil fields. Violence began in the South Sudan after President Salva Kiir announced that this his government has prevented a coup attempt by Vice President Riek Machar. Machar denied the accusation and accused Kiir of fabricating an excuse to crack down on opposition. Violence in the capital of Juba is believed to have killed hundreds of people, and the uprisings have spread. Unrest has continued along ethnic lines: Kiir is part of the majority Dinka ethnic group, while Machar is of the Nuer ethnic group. The unrest has already caused at least one international incident. On December 19, a group of armed Nuer youths opened fire on a United Nations base that was providing refuge for Dinka civilians. According to the UN News Center, two UN peacekeepers from India and 20 civilians were killed in the attack. In addition to UN peacekeepers, many foreign oil companies have staff stationed in South Sudan. These foreign civilians could now be caught in the cross-fire. 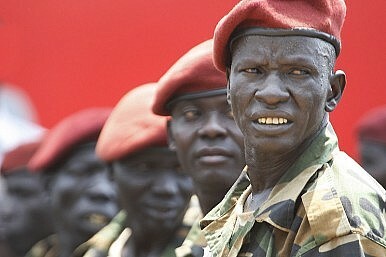 Rebel forces, according to the New York Times, have taken over control of some of South Sudan’s oil fields. In a press conference, Foreign Ministry Spokesperson Hua Chunying said that “China strongly condemns the violent action against the UN Mission in South Sudan” although she noted that “Chinese peacekeepers in South Sudan are safe.” She confirmed that the staff members of some Chinese companies in the region are preparing to return to China. “The Chinese Embassy in South Sudan will continue to provide necessary assistance for the Chinese citizens in their evacuation, and it calls on the government of South Sudan to ensure the safety of Chinese citizens and institutions,” Hua said. The violence brings upheaval to a region that many hoped would settle down after years of the bloody civil war that preceded South Sudan’s official split from Sudan. That conflict was a particular headache for China. Beijing had invested heavily in Sudan’s oil industry before the violent civil war resulted in South Sudan’s independence. The founding of South Sudan meant that much of the oil China sought was now located in a different country. China recognized South Sudan in July 2011, shortly after the new country’s founding. Hu Jintao sent a congratulatory message to South Sudan’s new president, saying that “China respects the political system and development path the South Sudanese have chosen.” Hu added, “China also stands ready to establish and develop friendly and cooperative relations with the new nation based on the five principles of peaceful coexistence.” One of the referenced five principles is non-interference in each other’s internal affairs, a principle that will become increasing difficult for China to honor if foreign unrest affects Chinese citizens and business investments. Many are concerned that the violence will interrupt the country’s oil production, which is a crucial part of South Sudan’s economy. Global Witness estimates that oil revenue makes up 98 percent of South Sudan’s annual budget, making oil production a logical target for rebels. China National Petroleum Company moved Friday to evacuate oil workers to South Sudan’s capital, Juba. About 200 oil workers fled to a United Nations base in Unity State, seeking refuge from the violence. Xinhua notes that South Sudan’s government insists that “oil is flowing normally from the production sites to Sudan’s oil pipeline,” but with rebel action targeting oil fields it’s obvious that continued production is in question. Beijing already has a lot invested in South Sudan. Since the country’s founding, China has offered the South Sudan government loans and assistance for various development projects, including a September 2013 deal to provide aid to South Sudan’s mining industry. China’s oil companies are also active in the oil-rich state. According to Reuters, CNPC is a major shareholder in two large oil groups operating in South Sudan, Petrodar and the Greater Nile Petroleum Operating Company. Chinadialogue reports that China consumes over 80 percent of South Sudan’s oil exports. Now, once again, China finds its investments in jeopardy. On Monday, Hua noted that “China is greatly concerned with the development of South Sudan’s situation, and is promoting negotiation with its own way.” “We will work with all relevant parties to promote the conflicting sides in solving their disputes through dialogue and negotiation, and promote the situation of South Sudan to resume stability as soon as possible,” Hua said. However, Beijing’s options are limited by its long-standing insistence on non-interference in other countries’ internal affairs. China has made non-interference a keystone of its foreign policy, in part because China would like other nations to accord Beijing the same courtesy. However, as Chinese companies are increasingly global players, China’s non-interference policy may come to clash with other fundamental national interests. Beijing is greatly concerned with ensuring food and energy security — two needs that are tied to foreign supply chains. When the internal unrest of another country, such as the South Sudan, threatens one of these interests, Beijing has tough calculations to make. Does a strict adherence to non-interference outweigh the potential threat to oil supplies? And what about the lives of Chinese citizens in affected areas? Already, China has been pushed to mediate between South Sudan and Sudan to ensure oil production continues. When South Sudan shut down oil production, accusing Sudan of stealing oil, China was forced to help resolve the dispute. This time, the conflict is between internal factions within South Sudan. If China were to mediate, it would risk violating the sacrosanct principles of non-interference. This explains Hua’s caveat that China “is promoting negotiation with its own way.” Beijing can’t afford to do nothing, but its hands are tied by its foreign policy principles. Can China Remake Its Image in the Middle East?China in the Middle East: Past, Present, and FutureChina’s Energy Security Achilles Heel: Middle Eastern OilUN Report: China Sold $20 Million in Arms and Ammunition to South SudanChina: The World’s New Peacekeeper?